An antique appraisal will require that the appraiser authenticates an antique item and at the same time puts a value on it. If you need to know the value for insurance purposes or similar, or if you want to sell it, you can ask a professional antique appraiser for an appraisal. The appraiser will have to clarify authenticity first before putting a value on it. If you own an antique item and wish to know more about it, you can request a knowledgeable collector for an opinion on its authenticity, but this may not necessarily clarify its value. Especially if it concerns Chinese antiques, the average collector may not know enough about an item's authenticity. Even if you have sufficient specialist knowledge to identify or authenticate the antique yourself, it may still be a good idea to ask for an appraisal, or better more than one, if a costly antique is involved. Authenticating an item is not the same as valuing it. Estimating the price may need much experience in view to the market, and a good database of past sales. The value of antiques depends on the market demand for specific items, which in turn depends on the supply and demand situation for these. An item's condition and quality is another factor. Professional appraisers of antique ceramics are more likely to be up-to-date with such information, and may be able to provide a more reliable appraisal for you, as they have access to records and databases of past sales, auctions, etc. Appraisals of Chinese porcelain cannot be handled just by ANY antique appraiser. Only an appraiser specialized on Chinese ceramics will do! Make sure that you find a professional appropriate for "Chinese ceramics", not just any ceramics; even if there is a specialist in Asian ceramics, it is recommended to make sure that the emphasis or specialization lies on Chinese ceramics. Someone specialized on Japanese or other Asian ceramics may not do! Today's authentication situation is too complex that just any expert would do. To find an appropriate appraiser in your field you can check with organizations like the professional appraisers association or society of appraisers in your area. You can also try to get an informal verbal opinion from an antique dealer at events like an antiques roadshow, at an antiques fair, etc., but this is not the way to go with potentially valuable Chinese ceramics. A more viable alternative might be an online appraisal. The drawback is that the appraiser cannot do a hands-on inspection of the actual item, he/she has to rely on pictures (see comments below). But, if the pictures are excellent, there is a good chance that you have an idea what you got in hand, afterwards. An online appraisal costs much less and may be the way to go before requesting a costly and time-consuming evaluation by a professional appraiser. After all, who wants to spend a lot on an appraisal of an item that has little value. Be careful of unscrupulous appraisers. Ask for a quotation or price for the antique appraisal beforehand, just to make sure it doesn't add up too much. Don't tell the appraiser you know nothing about the item. If the appraiser offers to buy your item, stay away! The estimate given to you might well be lower than its actual worth. Never sell an item to the appraiser. If your item could be very valuable, it is always better to depend on more than one independent valuation to make sure that the estimate is reasonable. A professional authentication and valuation by an antique appraiser is also recommended before you purchase or bid on any antique of considerable value. 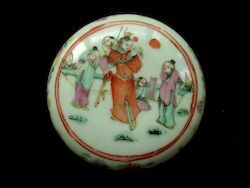 when it comes to antique Chinese porcelain an antique appraiser specialized in Chinese porcelain is needed - it is not that just ANY porcelain appraiser will do. Dealers and collectors involved with Chinese antiques in general (other than porcelain) aren't suitable either. They often know next to nothing about Chinese ceramics. 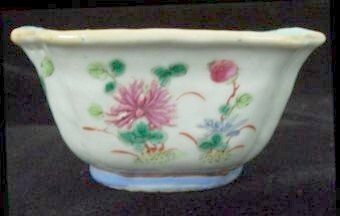 Just because someone is expert in view to European or other Asian porcelain does not mean they also can do an antique appraisal of Chinese pottery and porcelain properly. A straightforward expert in Chinese ceramics may tell you that he/she is specialized on certain types of Chinese ceramics. Often this separation is done by age (see separation by age). Usually, one large group includes the Ming and Qing dynasties, and early republic, while the other is the Song/Yuan dynasties and earlier ceramics (mostly down until around the Sui and Tang dynasties). These groups each span a ceramic history of considerable length - over 600 years. It is completely unbelievable that any single individual or appraiser has expert knowledge over this whole period, even if specialized on Chinese ceramics. Therefore, when requesting an antique appraisal, if an appraiser claims he appraises or knows "most" Chinese porcelain, better stay away. You might just be wasting your time. In western countries appraisers will mostly only be able to do appraisals for Ming and Qing dynasty items, including probably those of the early republic period. Online appraisal or conventional appraisal? You can consider an online appraisal before you buy, if you have access to detailed images of the object. This should be easy if you have access to an electronic auction catalogue or photographs, except that with auctions the bottom is frequently not shown, which is important for evaluation. Having your own item appraised or valued after you bought it is of course the simplest, as you can shoot pictures as you like. One of the few advantages of online antique shops or online auctions is just this -- easy access to images of the item in question. These can be used for an online antique appraisal or appraiser opinion which in turn can help you make a quick decision whether to go for it or not. With Chinese porcelain it is often advisable to get a second opinion before spending a lot of money on expensive antiques; otherwise you may find later that they are fakes. If you have your own expert knowledge, that would be most ideal, though. Online antique appraisals have advantages and drawbacks, but so do conventional (offline) appraisals. It all depends on the situation... and your budget. The availability of quality images of the item is all-important for the feasibility of an online appraisal, and the quality of the images may affect the result. But ... don't even consider trying to influence the appraisal by providing modified pictures or by not supplying pictures showing details that may negatively affect the result! It is your own choice to get a valid appraisal. The failure of recognizing authenticity or value in such a case is the customer's responsibility, not that of the appraiser. A free antique appraisal - does it exist? Many people new to Chinese porcelain or antiques in general appear to have the misconception that a collector or appraiser can look at an item and instantly knows what it is and how much it is worth. Maybe such misconceptions come from watching TV programs like the Antiques Roadshow? The appraisers in those TV programs are mostly specialized in a single or a few item categories and/or periods only. If they encounter something unfamiliar, they must consult with colleagues. They may not be able to appraise items outside their range of knowledge. Researching an item can be time consuming, and these TV shows will be able to provide free appraisals only because it is important for selecting the final few appraisal objects that people see on TV. An appraisal is the process of identifying and authenticating an item, and possibly its source, age and market value. The whole process may be time consuming, taking time for research in some cases and, depending on the item at hand, it may require combing through many data or books to find information. With an item that may have little real value, except in the eyes of its owner. Would an appraiser do that for free? Learning about the traits of antiques takes years and years of experience and study, thus a professional appraiser will can hardly afford doing this for free. An informal verbal opinion by a dealer or at an antiques fair seems more likely, but it does not have the value of a written professional appraisal. An instantaneous opinion by a dealer is not the same, as he will be unable to consult books on such an occasion. It is really just a quick identification of an item and an opinion in view to its value, from memory that is. What may be easier to get for free instead could be an antique identification, but perhaps not with a value estimate, because again, the latter may need a database or knowledge of the specific market, or books and records of past sales or auctions, etc. That is the prerogative of a proper appraisal or valuation, if you don't want to do the research yourself. If you get your item identified, then you can try to find its approximate antique value yourself online. This way you may be able to get an idea what you have or what its value could be before requesting a formal appraisal. Be sure to get a paid appraisal, or even more than one, if you find that your item could be something of greater value. We should always be aware that any evaluation, be it a formal appraisal or informal opinion is never 100% accurate. A number of factors are evaluated and compared to the same comparison points either of actual antiques, or experience/knowledge of the evaluating person. With very good pictures a high accuracy may be possible, but sometimes it is necessary to look at the weight or ring of an item, or bubbles and other minute details need to be viewed with a magnifier. As the evaluating person is unable to do this in person if images are involved, this affects accuracy somewhat. In a few cases the evaluation is impossible. With a supposedly valuable item, always consider to get two or more opinions or evaluations. Every collector, even experts and professionals, who may deny this, have been fooled by high-level fakes at one time or another. That is normal. Such experiences contribute to the overall growth of the specialist knowledge they have.